"A country with everything - from the history of the ancient sites to the wonder of the luxury hotels and beaches"
Egypt is an incredible holiday destination, offering everything a visitor could ever ask for. Try soaking up the Eastern atmosphere in the souks or experiencing ancient history up close and personal, examining gigantic hieroglyphs for yourself. If you’d rather indulge in a little pampering, relax in tranquillity by the azure sea before enjoying an aromatic massage in one of their world-class spas, on your spa holiday. Its main cities are dotted along the banks of the magnificent River Nile and feature a vast array of majestic monuments, including the Great Pyramid of Giza, the only remaining ancient wonder of the world; The Great Sphinx, a massive half-lion, half-man sculpture and the Temple of Karnak, one of the largest and best-preserved temple complexes in the world. 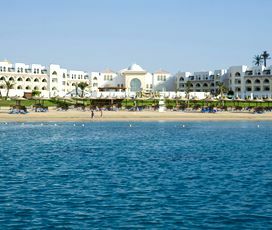 Coupled with this are a series of sensational beach holiday destinations that are situated along its Red Sea Coast, offering sapphire waters and a vast array of exciting watersports. This along with the friendly people, tasty food, great shopping and vibrant nightlife make Egypt the ideal family holiday destination, for everyone. Egypt is situated in the northeast of Africa, linking the continent with the Middle East. It is bisected by the famous River Nile that runs the length of the country. It also offers access to the beautiful waters of the Red Sea, famed for the incredible variety of marine life that lives there. Its most famous historical monuments are located on the banks of the River Nile, including the famous pyramids, the Great Sphinx and the temple of Karnak. Its capital is Cairo, which is situated on the Nile and lies just a few kilometres from the aforementioned pyramids. It is a large country with a population of more than 95 million. The weather in Egypt varies from surprisingly cold to very hot. This desert like weather, means that there is little rain and visitors need to be more worried about the heat of the sun. Inland places like Cairo and Luxor can get very hot during the summer months, with temperatures that regularly exceed 30 degrees. The same is true of the coast, although there, visitors can cool themselves off in the azure waters of the Red Sea. The best time to visit is between April-May and September-November, when it is hot without being extremely hot. The country’s history is long and rich dating back further than the vast majority of countries. It is intrinsically linked to the fertile land around the River Nile, with the Ancient Egyptians realising that if they planted their crops close to it, then they would grow thanks to its regular floods. This made the Egyptians richer and more powerful than the vast majority of societies in the ancient world and allowed them to build many of the incredible monuments that they are now famous for. Egyptians created language in the form of hieroglyphics and built incredible monuments to their pharaohs, including the Great Pyramid of Giza, which is the only remaining ancient wonder of the world. Egypt was eventually conquered in 330 BC by Alexander the Great and came under the influence of his Ptolemy following the wars of the successors. They ruled for the next 300 years, with the last and most famous in the dynasty, being Cleopatra, who charmed both Julius Caesar and Marc Anthony. By then Egypt was a Roman protectorate, a state of affairs that lasted until the end of the empire, whereupon, it fell under Arab rule after the Muslim conquests. It then passed to the Ottomans, before, becoming a part of the British Empire, until it received its independence. Its varied history influenced by the many places that it has either controlled or been controlled by has played a huge part in its gastronomy. It has been famed since ancient times for its ability to produce cereals, with bread and rice crucial to the Egyptian diet up until this day. The most popular dish is Koshary, which is made out of rice, macaroni and lentils and is coated in a special tomato sauce. Ful Mudamas is also very popular and combines a variety of beans that are mixed with spices and other things. Fiteer is Egypt’s version of pizza, where they layer filo pastry on top of each other and can be ordered either sweet or savoury depending on your preference; Ful wa Ta’meya (Fava Beans and Falafel), the Egyptian version of fast food; Kushari, a dish that contains pasta, rice, humous and beans all cooked together; Kabab wa kofta (Grilled meats), served with Mediterranean garnishes and a whole host of other delicious dishes. No trip to Egypt would be complete without tasting Falafel, which is best enjoyed with bread and can be bought from many street vendors throughout the country. With a plethora of incredible family activities the younger members of the family are sure to enjoy exploring. Foremost of these are the vast array of amazing historical sites, including the Great Pyramid of Giza, the Great Sphinx, the Temple of Karnak and many, many more. Young children are also sure to enjoy the Ancient Egypt Museum in Cairo, which houses an incredible range of exhibits, including the famous Tutankhamun burial mask and mummies. The coastal area offers a myriad of great watersports and is famed for the quality of its snorkelling, making it ideal for active families who want to spend time on the beach. It’s nightlife is generally very good, considering it is a fairly strict Muslim country, although visitors should always be considerate of the fact that many of the local people do not consume alcohol. The best nightlife is generally found along the coast, with places like Hurghada and Sharm El Sheik especially famous for the quality of their clubs. In Cairo certain districts of fantastic nightlife, whereas in others there will not be a bar or club in sight. No trip to Egypt would be complete without a visit to one of the many fantastic bazaars, where shoppers will find a chaotic mix of shops selling anything that you could ever want. The most famous of these is the Khan El Khalili Market in Cairo, a 500-year-old maze selling everything under the sun. Cairo and the coastal towns like Sharm El Sheik also have plenty of international stores selling things from around the world, ensuring that there is something for everyone to but in Egypt. Haggling over the price of a good is common in Egypt and the majority of shops won’t expect you to pay full price (although they won’t complain if you do). As a general rule you should aim to pay around 70% of the asking price and not offer lower than 50%. Travel along Egypt’s ancient lifeline on a Nile River cruise. Those looking for the most leisurely of routes might enjoy boarding a Felucca, the ancient sailboat design dating back thousands of years in the region. Wildlife enthusiasts will love diving or snorkeling in the Red Sea. Sharm el-Sheikh at the tip of the Sinai Peninsula is a particularly fabulous place to discover exotic seascapes and submerged ruins. 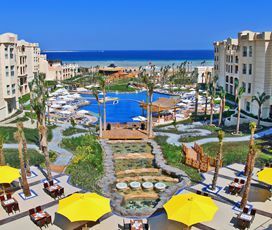 Sun worshippers have no problem finding a place to unroll their towel with miles of golden beaches stretching along the coast including the worldrenowned resorts at Hurghada and El Gouna. These happening resorts are also fantastic places to head out for a night on the town with a number of chic and stylish clubs to explore. There is no limit to the number of fascinating places and world famous monuments to see in Egypt. At the top of the list are the pyramids of Giza and the Sphinx. The scale and stature of these man-made marvels never ceases to amaze. Visit Karnak to pore over the intricate hieroglyphs from one of mankind’s earliest written languages carved along the circumference of 134 massive columns. The tombs and chambers in the Valley of the Kings are also decorated with intricate runes that indicate the somewhat-macabre funerary rituals of the time. The Egyptian Museum and its Royal Mummy Room is a must-see for those visiting Cairo. Of course Egypt is also home to breathtaking landscapes such as the Siwa Oasis and Red Sea coastline that offer great activities for outdoors aficionados. Cruising from Luxor to Aswan and back again, you will have the chance to explore some of Egypt’s most important sites, including the Valley of the Kings, Philae Temple, the Colossi of Memnon, Karnak Temple and the Aswan High Dam. All our Cruises include excursions and are based on full board, with meals provided - the only extra cost you need to allow for, is drinks. Below is a sample seven night itinerary. Shorter itineraries of three and four nights are also available and extra excursions including the Luxor and Aswan Sound & Light Show and Abu Simbel can be pre-booked via our Reservations team. It’s hard to find a better place to dive than the Red Sea. Add to that the region’s all year round sunny climate, high quality accommodation and array of activities on dry land and in the water and you can see why divers and tourists alike flock here year after year. The friendly locals are always ready to extend a warm welcome, and for UK divers, all this is a mere 5 hour flight away. Easily accessible dive sites, excellent underwater visibility and the calm waters available in parts of the region make ideal conditions for learning to dive, while qualified divers will find plenty of excitement on the more challenging sites such as the SS Thistlegorm wreck and the Ras Mohammed national park. Since the first course opened in Egypt in the late 19th century, golf has continued to grow in popularity with courses peppered along the Mediterranean, Red Sea, and the Sinai coasts. Courses on the Red Sea and Sinai coastlines offer particularly beautiful vistas as a backdrop to your game and there are courses to suit all tastes and all standards. Whether you’re racking up the hole-in-ones or would love to learn but have barely touched a putter in your life, our Egypt golf holidays will delight fans of the sport. Cyplon Holidays has extensive experience arranging Egypt golf holidays and will help you find the best course to enjoy a round and perfect your swing. 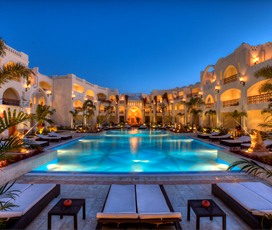 Luxury Holidays in Egypt . 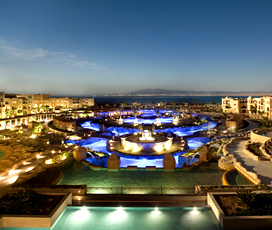 All Inclusive Holidays in Egypt . Adult Only Holidays in Egypt . Beach Holidays in Egypt . City Breaks Holidays in Egypt . Cruise Holidays in Egypt . Family Holidays in Egypt . 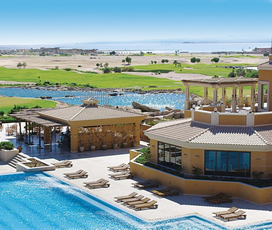 Golf Holidays in Egypt . Romantic Holidays in Egypt . 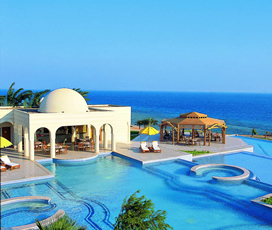 Spa Holidays in Egypt . Group Holidays in Egypt .